Today has been a great day. I attribute this to a few things: 1) Not having to chew my Green Monster this morning, 2) A great 4 mile run in between downpours of rain, 3) I finished all my Farmer’s market prep, and 4) I got some very exciting travel news (info to come later). A beautiful negative split! With each negative split, they become a bit easier. For my post on how to run negative splits see here. I was very thankful for two things: 1) Camelbak (I would not have been able to run today without a constant supply of cold water), and 2) Eric gave me his old Shuffle mp3 player (mine broke!) so I had my music. Favourite running song today: ‘One Life Stand’ by Longo & Wainwright. It is a GREAT running song with a fun beat. I had high hopes for tonight’s dinner recipe. Do you ever see a recipe and you say to yourself, ‘If this is as good as it looks my world will be forever be changed?’ That is how I felt when I saw Scalloped Tomatoes With Croutons. The only thing I had to do was veganize it- no problem, right!? This is hands down one of the best recipes I have ever made. 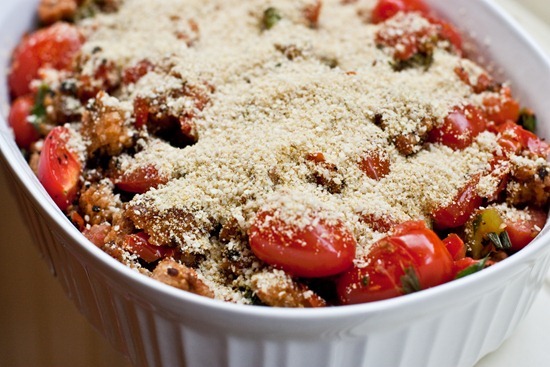 You will not believe your taste buds when you try this casserole. Two notes: Do not remove sugar as it brings out the wonderful flavour in the tomatoes and two, don’t even think about leaving out the fresh basil. It made the entire dish! One thing I love about this recipe is the short ingredient list…it was so easy! 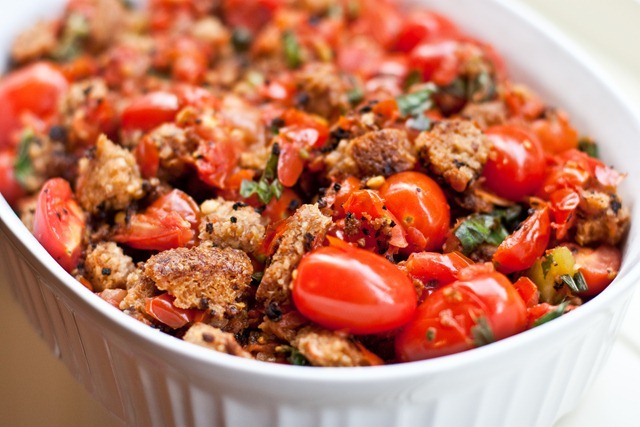 Adapted from Smitten Kitchen’s Scalloped Tomatoes With Croutons. Directions: Preheat the oven to 350°F. Heat olive oil in a large skillet over medium-high heat. 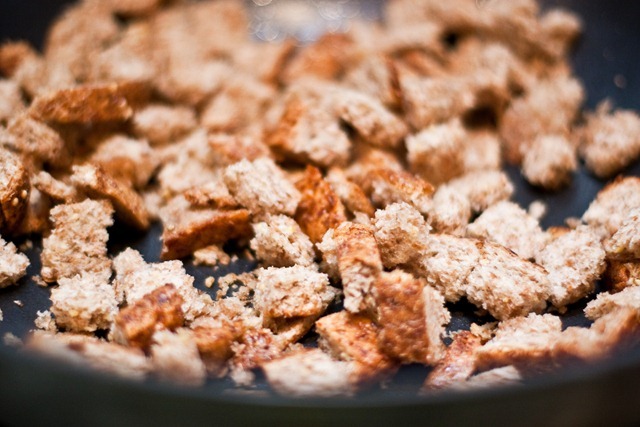 Add the bread cubes and mix well with oil so that they are evenly coated. Cook bread, stirring frequently, until crisp on all sides for about 5 mins.While the bread is toasting, combine tomatoes, garlic, sugar, salt and pepper in a large bowl. When the bread cubes are crisp, add the tomato mixture to the skillet, stirring frequently for 5 minutes. Remove from heat and stir in the basil. 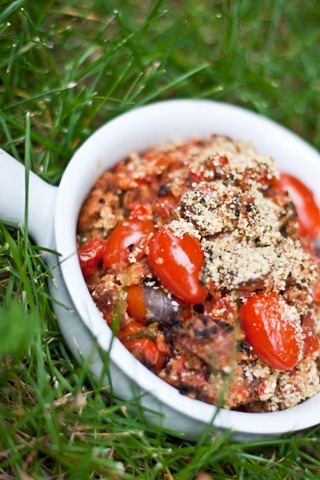 Pour into a 1.5 qrt/1.4 litre shallow baking dish and top with Parmesan cheese. Bake for 35 minutes until the top is golden. Allow to cool for at least 10 minutes before serving as the tomatoes are VERY hot! (Yes, I burned my tongue! haha). Serves 2-4. Instead of French bread I used 3 slices of Ezekiel bread and kept the crusts in. This simple switch added 3 servings of whole grains! For the tomatoes I used organic grape tomatoes. 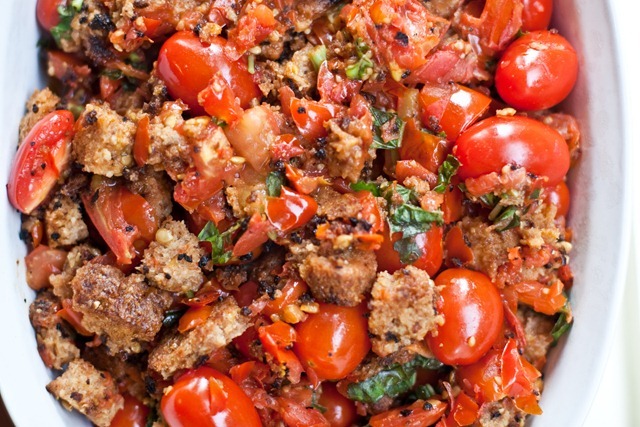 If you can get your hands on some grape tomatoes, I highly recommend using them in this dish. They had the most amazing flavour that went so well with the basil! 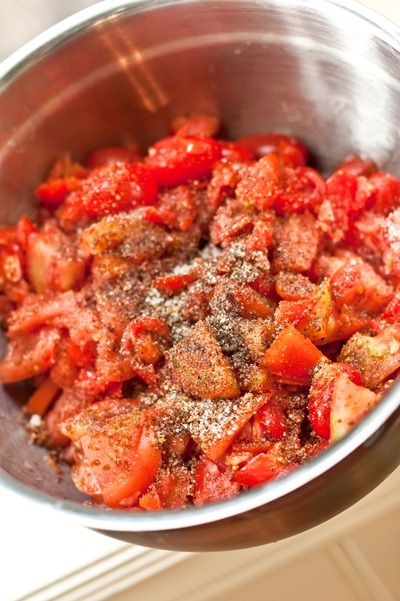 To speed up the process, I tossed the tomatoes into the food processor and pulsed for 3-5 seconds. I left some whole and some diced. It worked perfectly! Look at the fresh basil Eric gave me last night! Yes, yes it was. I loved that this dish called for a 1/2 cup of it. The more, the merrier. There is honestly no better smell than fresh basil. After the above cooks for just 5 minutes, stir in chopped basil and scoop into a 1.5 qrt./ 1.4 litre casserole dish. This size fit perfectly, but of course use whatever you have on hand. 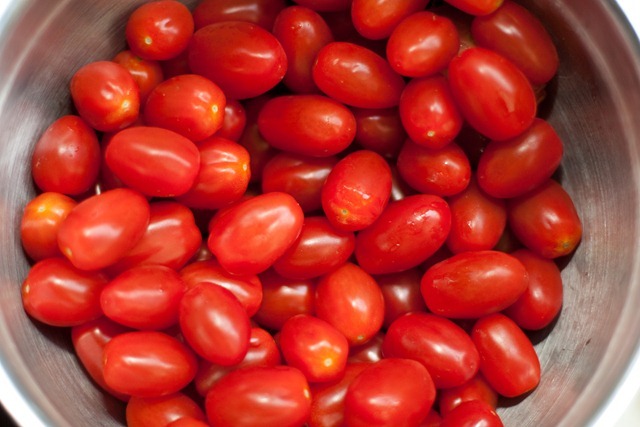 Confession: I tried a bite because it smelled so good and I burned my tongue on a tomato with a sizzling hot core. Ouch! It was worth it though. So much so that I burned my mouth again when it came out of the oven! I wish I could give you some right now so you could understand my delight. Sprinkle with cheese and bake for 35 mins at 350F. It was so good I had two bowls and I probably would have had more if I could have fit another bite in my belly. 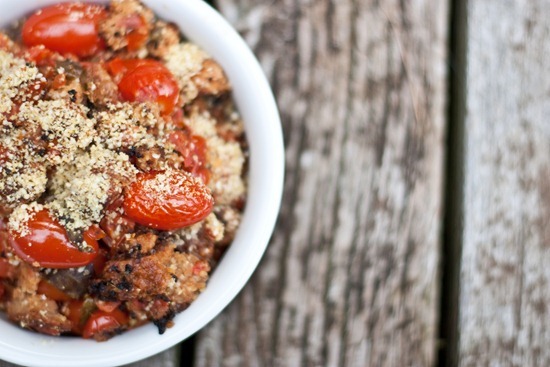 This recipe is definitely in my top 5 dinner recipes! It is a perfect summer casserole. Eric loved it too and asked me to ‘make it once a week’…lol. First up, a huge thank you to everyone who participated in my Healthy Living Summit charity raffle for the Canadian Cancer Society. This raffle raised $220! I surpassed my goal of reaching $6,500. I numbered how many tickets the person purchased beside their name and then I used Random Number Integer to draw the random number. Odds were 1 in 31. 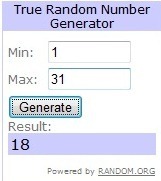 I am happy to congratulate Dawn W. as the winner of the ticket! Congrats Dawn, I am looking forward to meeting you in August! Please email me ([email protected]) and we will take care of the ticket transfer. See you tomorrow morning before the market for an Oatmeal Cookie Vegan Overnight Oats recipe and pictures of our 1st food collage! That looks absolutely gorgeous and great tasting! i hate humid runs myself, but you are such a trooper for running in it! I bet you drank a huge glass of water afterwards too!! That looks delicious! I’m making it as soon as I can! I don’t know how you ran today in that humidity! It was so humid, it fogged up my glasses every time I went outside from the air conditioning!!!!! I tend to give in and skip my workouts on sweaty humid days. Then I’ll have that guilty feeling all day. Nice run, even in the heat. Few thing are better than fresh basil! 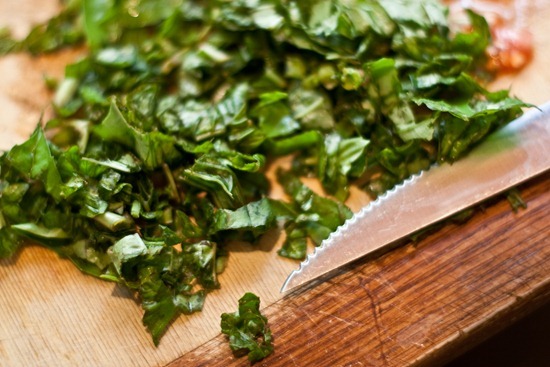 Mmm, herbs. I hate runs like that! But that food looks amazing! I have been thinking about this recipe ever since I saw it on the Smitten Kitchen website. Definitely going to make it now! This has very little to do with your post (except maybe the last sentence, which made me look forward to tomorrow) but just tried your chocolate cherry bomb VOO for the first time today and WOW. Yum :) Thanks for sharing as always! I can’t wait to see your collage! I bet it is beautiful. Grape tomatoes are my favorite tomatoes — they are so cute! I will have to try that recipe, all I need are grape tomatoes, basil, and a few other things. :) I have the ezekial bread though! 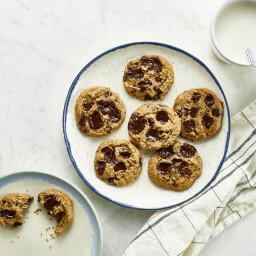 I just saw this recipe on smitten kitchen and yours looks just as good as hers! Oh my goodness. I MUST make this. 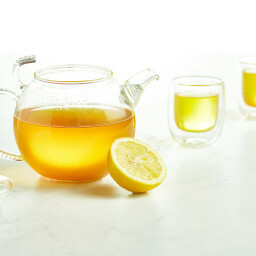 Delicious looking recipe! I just got a ton of tomatoes from a Vermont farmer’s market’s last call, and now I have an idea of what to do with them. 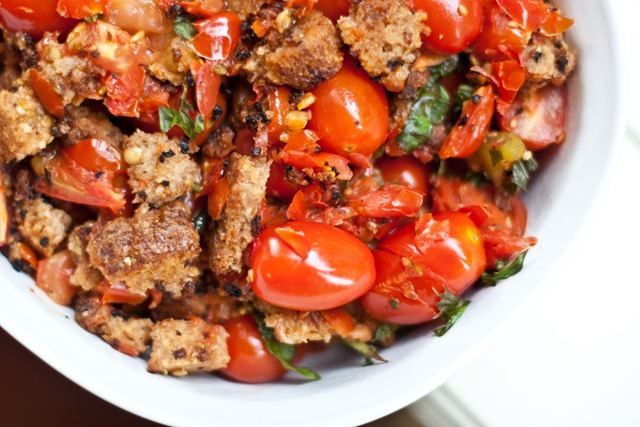 Tomato and basil, you can do no wrong! What a beautiful casserole! I wish I could taste it through my computer screen right now!!! I’ll definitely be making this soon! Thanks for sharing! Wow, this recipe looks INCREDIBLE. Soooo going to make this with my mom on one of your girls nights…she and I are obsessed with tomatoes and our basil plant outside it taking over!!! Thanks for the recipe! That tomato recipe looks AWESOME! 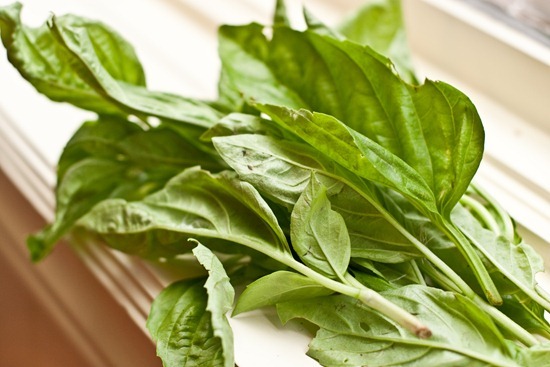 We have SO MUCH fresh basil in our garden, I just might try your recipe this weekend. We’re banning oven use during the summer/heat, so I’m going to try it on the BBQ (if possible). I’ll keep you posted! Yum! That DOES look good. 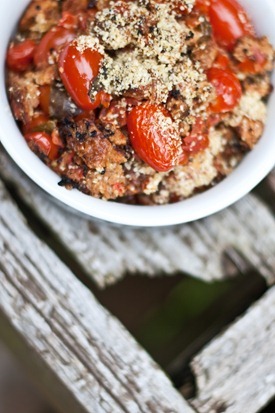 I showed it to the hubs and he said, “Wow, anything with croutons and cheese sounds good!” I am trying tomorrow! Thanks! It’s so weird to see a recipe from one blog I read on another blog I read! I will definitely have to try this now, I already had it bookmarked after I read Smitten Kitchen the other day. Did you sprinkle it with vegan cheese? This looks so delicious. Bookmarked, truly! I started reading your post and thought…hmm…that looks familiar, is it…yes! It’s from smitten kitchen! I love her website, also! And I totally want to try this recipe now that it has been approved from a trusted source :) Have a great night! Okay, so this is definitely going to be a recipe I make for FH after we get married to impress him with my mad skills (there i go again) in the kitchen! This looks soooooooooooooo good!!! You just totally made my day – and I had a really great one! ahh when i saw that recipe on smitten kitchen, i thought the same thing you did. so glad you gave it a good review and showed a vegan variation. i’ll have to make it as soon as i can get my hands on some really good tomatoes! That looks so unbelievably good! I remember making tomato sauces and soups with a bit of bread in them…wauv. Trying to wrap my brain around a version that I could eat – otherwise I’m making it for the bf just to watch him eat it, hahaha…Beautiful pictures too! I hate humidity. Glad you had a great run though! I’m heading out on a run in the humidity soon…it’s going to be killer! I love the scalloped tomatoes idea. I used to love scalloped potatoes, so these look delicious! Thanks for sharing! 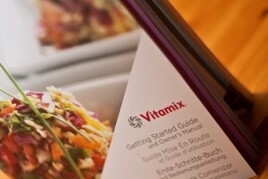 I’ve added this to my Recipe Wish List! Looks and sounds delicious! This looks amazing! My basil has literally taken over my garden, so this is a perfect way to use it up. That dish looks delicious and I’m not even a huge fan of tomatoes. That looks beautiful! I hate it when I burn my tongue though, I can never taste things right for the rest of the day! If I get myself good, two days. I was drooling over that recipe when I saw it at Smitten Kitchen too. I looove tomatoes. I was planning on trying to veganize it myself, but now I can just try your recipe! Made this dish for dinner tonight and oh my it was so good I had two servings. Thanks for the great recipe. I made this recipe tonight. It was amazing!! I never would have imagined something Sao simple being so delicious! Thank you for sharing this!! I agree it was so easy…im happy you liked it! Holy moly, I just made the casserole for dinner and it was HEAVEN. I sauteed up some onions and added in to the mix. Yum. Thanks Angela!!!!! I’ve been ‘following’ your blog for a while & love it! Thanks for all the fitness inspiration. 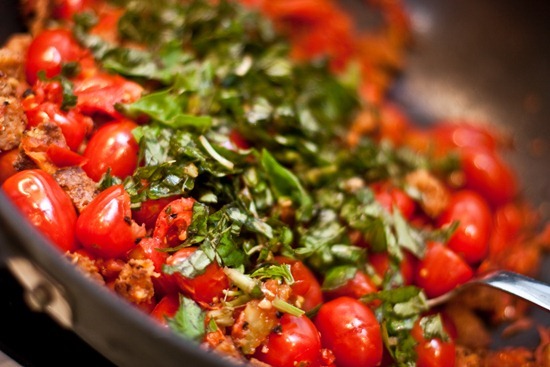 Also…I made the Basil Scalloped Tomatoes tonight & it was a HUGE hit…with me & my hubby both! Thanks so much for that recipe. I will use it many times in the future!! Thank you for your kind words about the blog! Wow. That recipe just went into my “make immediately” file! Yum! I made this last night and will make it again… better next time. It was good, but I didn’t get the bread toasted enough and I only had 1 lb of grape tomatoes instead of 2 1/2. I can’t wait to make it again! I don’t cook often, but you’ve become one of my go-to sites for ideas when I do take to the kitchen. After picking up our CSA this afternoon, I decided to try out this one, as well as your vegan enchiladas to have in the house for the rest of the week. Everything is in the oven, the house smells AMAZING, and I can’t wait for dinner. Thanks for all the great recipes! I’m eating the tomatoes and cruton dish now and it is awesome. Thanks for a yoummy dinner. Sooo amazing, Angela! I knew I would love this because of your rave review! My husband, sister and I all really enjoyed it. We had it with sides of local corn on the cob, and a big salad with your better than bottled balsamic vinaigrette! This meal is in the oven right now. Thanks for another tasty dinner! I am SO done with the humidity. I run inside on a treadmill in high summer and deep winter because I’m a big baby. Bring on fall and crisp outdoor runs! 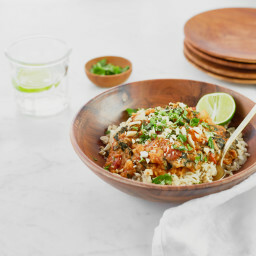 I’m making this for dinner tonight! Looks delicious. I just got a bag of fresh tomatoes from my friend’s garden, and was looking for tomato recipes. All 10 of your recipes look great. 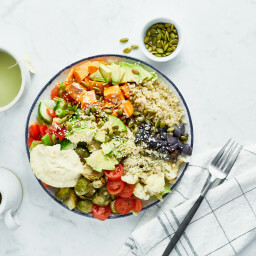 I’m not a vegan, but love your site! I’m making this tonight!!!!!!!!!!!!!!!!!! Along with the Avocado pasta!!!!!! OK!!!!!!!!!! I made it and it was AWESOME!!!!!!!!!! And my guests LOVED it!!!!!!!!! Some of them are carnivores so they want to add meat to the next one………..but I’ll stick to the original recipe!!!!!! Your recipes look amazing! I just started this new vegan lifestyle and am excited to try these recipes. The flavor of this dish was amazing but the bread was very soggy. Did you drain the juice that chopping up the tomatoes produced? Hi Annie, It’s been a while, but I don’t think I would’ve scraped all the juice from the cutting board in (rather picked the chopped tomatoes up and put them in that way) Also it’s important the bread is toasted very well beforehand. Hope it goes better if you make it again! It’s in the oven, CANNOT WAIT! Smells great, and I didn’t have fresh basil leaves but replaced them with the basil spice and some spinach leaves. Should be just as good! This dish is so delicious! My new favorite, and that’s why I’ve made it twice this week :-). With fresh basil in a container outside my sliding glass door into the backyard, and three weekly farmer’s markets for the freshest and sweetest ‘maters, I’m in Heaven! Thank you for your creations, Angela. You’re my go-to for dinner inspiration. Can I make this ahead of time for a picnic? I must travel 2 hours. 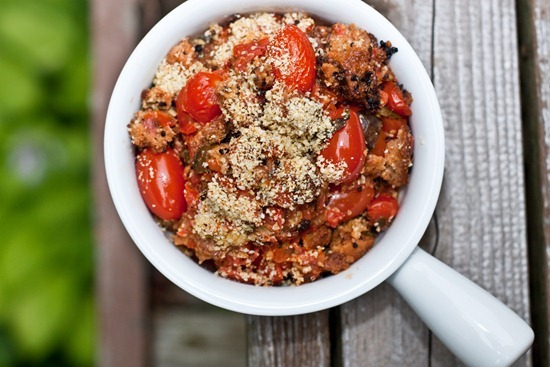 Or, would it be better to try your roasted tomato pesto pasta? Do you have any good picnic recipes? I want to make a dish for a vegan that will be there but something others will enjoy too. I want it to be more of a entree rather than a few veggies. Hi Sara, My guess is that it would become mushy with that much time…I wouldn’t suggest it. 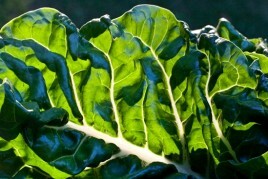 For a travel-friendly salad, I would suggest my Weekend glow kale salad: http://ohsheglows.com/2011/06/17/weekend-glow-kale-salad/ read the reviews – it’s a hit among many! This is one of the best things I have ever eaten! Hands down! I made this tonight and it was delicious !! Made the scalloped tomatoes and they are fab. I started by roasting a sliced sweet onion and three cloves of garlic for 20 minutes at 375. Then added the tomatoes for another 20 at 400. Smushed out the garlic, mixed in the croutons, added beans, added basil and topped with cheese. Wow! Had a wonderful run this am and this really made it a great day! 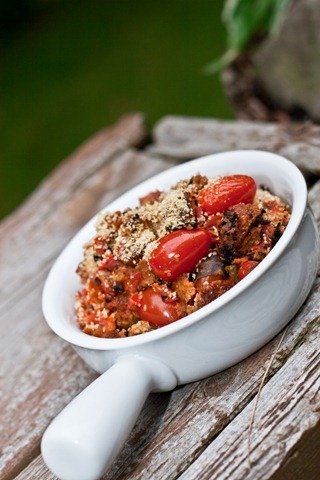 I make this all the time but I call it tomato sandwich casserole ,the tomato slices are layered with the herbs and garlic and on the last layer I spread vegenaise the purple lid then top with the olive oil coated ezekiel cubes and bake for 35 to 40 minutes. I love it and eat way to much of it for sure lol. I made this for dinner tonight and it was, indeed, amazing. Sadly, I had no fresh basil as I had stupidly made a big batch of pesto not hours earlier! I substituted 1.5T of dried oregano and it was actually excellent. I made this last night and LOVED IT! In fact, all three of my kids did as well! I write a recipe newsletter for a local CSA and I’m going to feature a link to your recipe! Thanks! I cannot wait to make this! I creating a menu for cook club. 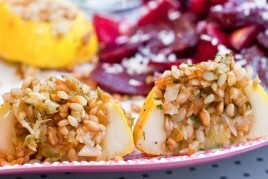 I want to make this with heat wave summer salad or whole foods layered salad. For appetizers, I am serving almond “tuna” salad on cucumber slices, cherries other fruit. I am thinking of the strawberry lime granita for desert. Any comments or other ideas? This is one of my favourties. I make it exactly as directed except for the bread – I change it up depending on whatever I have on hand. So easy and absolutely delicious :-) Thanks for the wonderful recipe! This recipe absolutely delicious! Thank you so very kindly for this & many other recipes in your book & on this website. Love your food. Tried this today for Valentine’s along with the crowd-pleasing vegan caeser salad. Both were a huge success, thanks for the brilliant recipes! Will be trying one of the desserts next. You always amaze me with your dishes…a few years ago i found your blog just as i went vegan…to this day i still make your recipes..
tonight i made this and it was amazing, but i added caramelized onions and my own roasted red peppers. Made this last night and tasted as amazing at it smelled! Ok, I’ve now made this three times and I think you should do a new feature on this. It is SO good. Each time I’ve made it I’ve thought “Really? Can this REALLY be that tasty?” – even the second and third time. And yes it can. Simple, delicious and at the moment very seasonal. What’s not to like! Hey Ida, Well, I had completely and totally forgotten about this recipe until I read your comment! 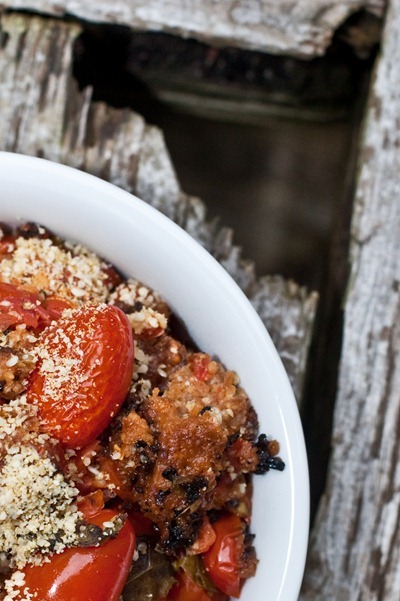 Thanks for the reminder; tomato season is the perfect time to whip out this recipe! I think I will have to make it this weekend. Happy tomato eating! I found this recipe because you featured Ida’s comment above this week. This is SO GOOD. The ingredients are humble, but holy cow – definitely making this over and over. I’m an omnivore, so I added a bit of chicken for protein, but that was my least favorite part :) The recipe as written is amazing. Thank you! I loved this recipe – used an assortment of our summer garden tomatoes. One twist I did was to use a clove of roasted garlic I had on hand instead of the fresh minced garlic. Also didn’t have any sesame seeds to toast for the vegan parm cheese, so instead used a combo of sprinkling nutritional yeast and vegan cheddar shreds. Hello, wonderful chef, wondering about the quantity that your 2 1/2 pounds of pulsed grape tomatoes came out to be. 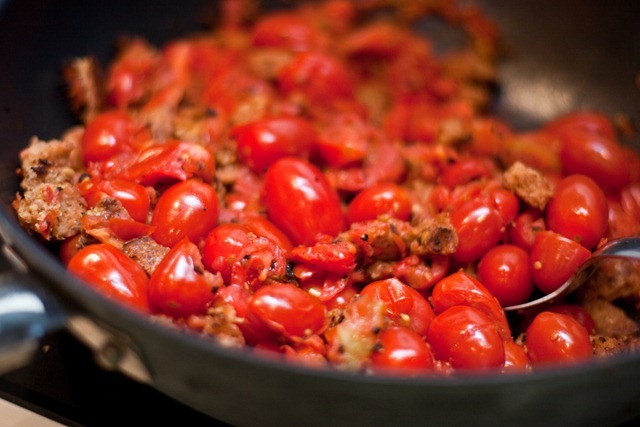 I have canned organic diced tomatoes, how much should I use? Thanks for all, you are so kewl!